The Muttart Conservatory is a botanical garden located in the North Saskatchewan river valley, across from downtown Edmonton. One of the best-known landmarks of Edmonton, the conservatory consists of three city-operated greenhouses, public gardens, as well as four feature pyramids for display of plant species found across three biomes, with the fourth pyramid hosting as a seasonal display. A fifth minor skylight pyramid lights up the central foyer. A donation from the Gladys and Merrill Muttart Foundation  provided momentum for the conservatory's construction, with the remaining funding supplied by the Province of Alberta and the City of Edmonton. 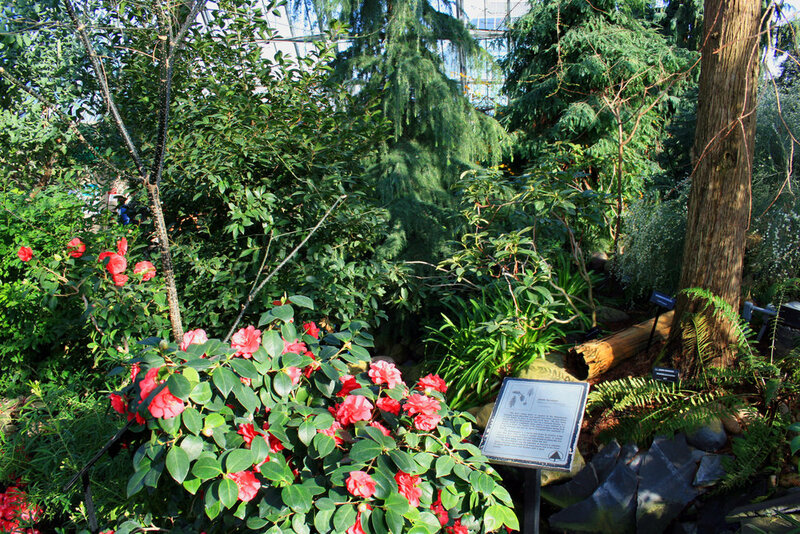 The conservatory is staffed and operated by the Edmonton Parks and Recreation Department. The conservatory's unusual structure, designed by architect Peter Hemingway is composed of four glassed pyramids built around a central service core. The two larger pyramids are 660 square metres (7,100 sq ft) in area, and the two medium-sized ones are 410 square metres (4,400 sq ft) insize. Three of the pyramids are devoted to displays of plants from the tropical, temperate, and arid regions respectively, the fourth being used for shows that change with the seasons and which feature massed displays of ornamental flowering plants.